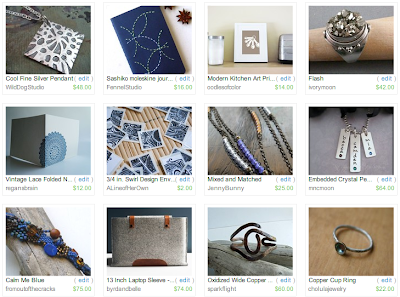 If you don't know Cheri or her Etsy shop From Out Of The Cracks, you're in for a real treat. Oh heck, who am I kidding? 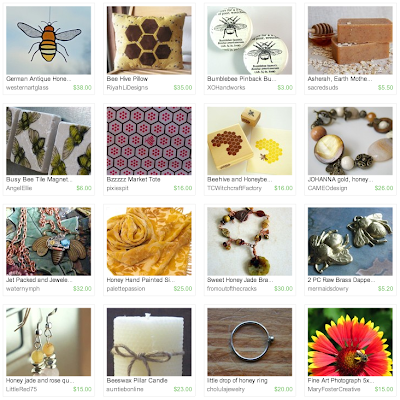 Even if you do know Cheri and her shop you're in for a treat. Not only is Cheri all upbeat and down-to-earth, her jewelry is too. 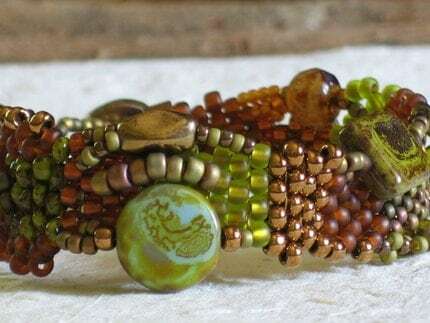 Most of her inspiration comes from nature and she's just crazy for colors. Pay a visit to From Out Of The Cracks. 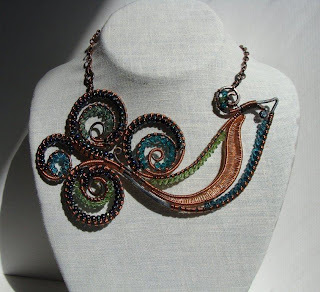 I think Cheri's work will amaze you so much you'll want to own some for yourself. Today we bring you this wonderful wine bottle gift bag from Deb of looksSEWnice! 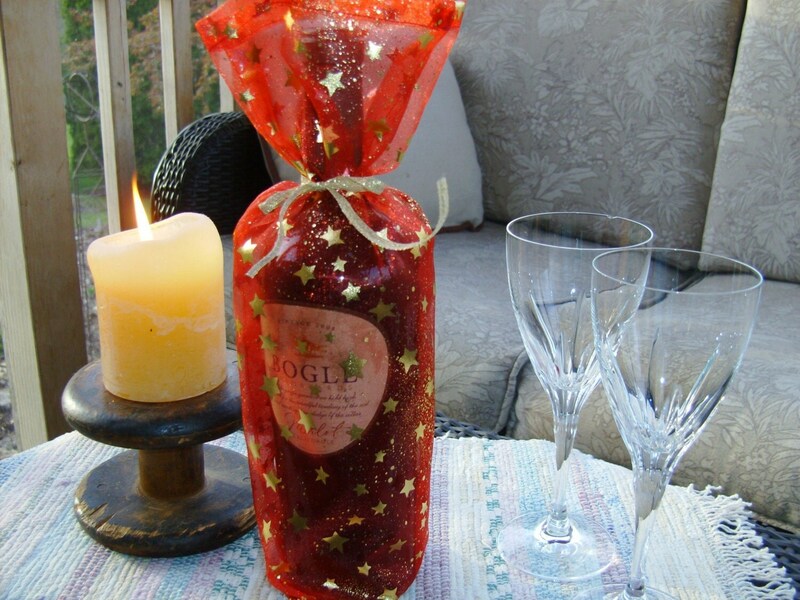 This is a classy, elegant, wine bottle gift bag which will shimmer, sparkle, and shine to delight the recipient. Made of a brilliant red, sheer fabric littered with gold shimmery stars and tiny speckles. 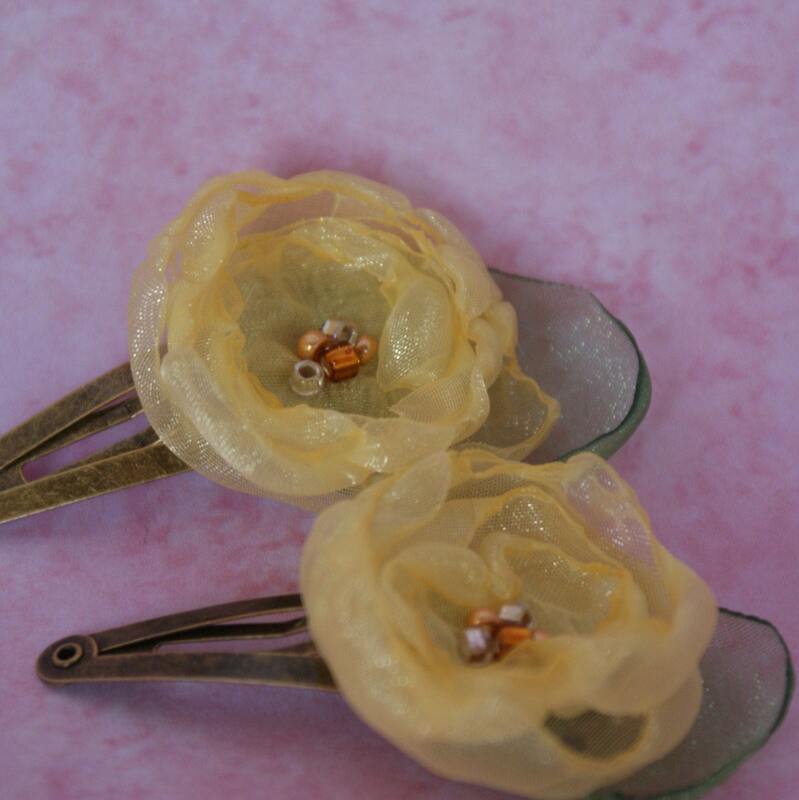 Deb has added a shiny gold bow as the perfect match. The fabric is soft but crisp, so it stands nice above the bottle. The bag is plenty long, as she likes to blouse it a little at the bottom for effect. This is a great gift wrapping for a wine bottle wedding present or birthday gift, hostess gift, housewarming gift or even to use as a centerpiece. Add a couple of wine glasses, and you have yourself a great present! Cheers! 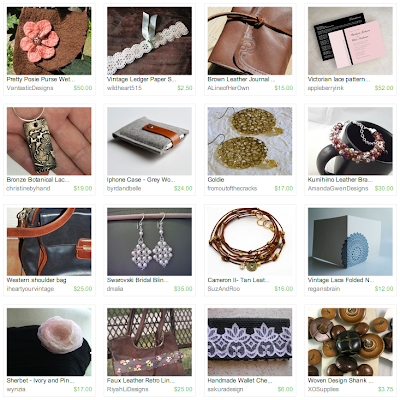 Visit Deb's shop, pick your favorite item and leave a comment on this post about it. Open to US and international residents . Contest ends Saturday, September 11, at 12:00 noon Central. One winner will be chosen by Random.org. Today we have a spicy dish from Jenny of Jenny Bunny. Jenny says, "I come from Minnesota, I'm Lutheran, put that together and you have some awesome hot dishes and goulashes! 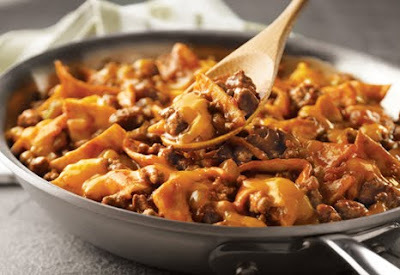 My sister stumbled upon this recipe somewhere and this one is spicy! Perfect with homemade bread to soak up the extra sauce! Also, my sister is an amazing cook/baker/person, so anything she does will be great!" 2 Jalapenos, take the seeds out and mince very fine. First: Cook hamburger, onion, peppers until well done, salt and pepper to taste. Boil noodles to al dente. Second: Put the hamburger, onion, peppers and noodles in large casserole. Add soup, tomato sauce, creamed corn and chili powder, stir until combined. Third: Bake at 350 degrees for about an hour. Feel free to reduce the amount of jalapenos. My sister adds more, but I follow the recipe! It's the perfect amount of kick! 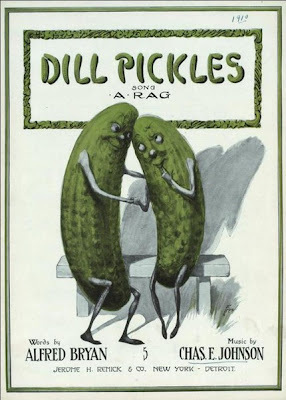 And while I eat this spicy dish and also enjoy pickles so much, I would enjoy looking at these fun "Dill Pickles" refrigerator magnets from Auntie B's Wax! Today we bring you this fabulous 6x6 16 page chipboard album with a family theme from Natalie of JuJu Bees Boutique! 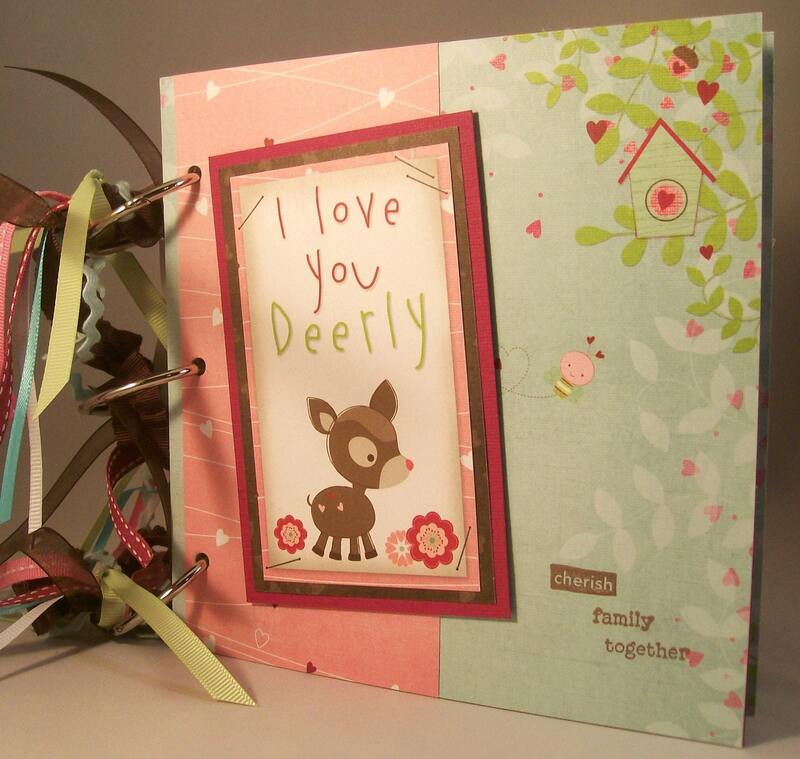 This is a 6x6 16 page chipboard album with a family theme. You can add your photos, your memories and you are done! 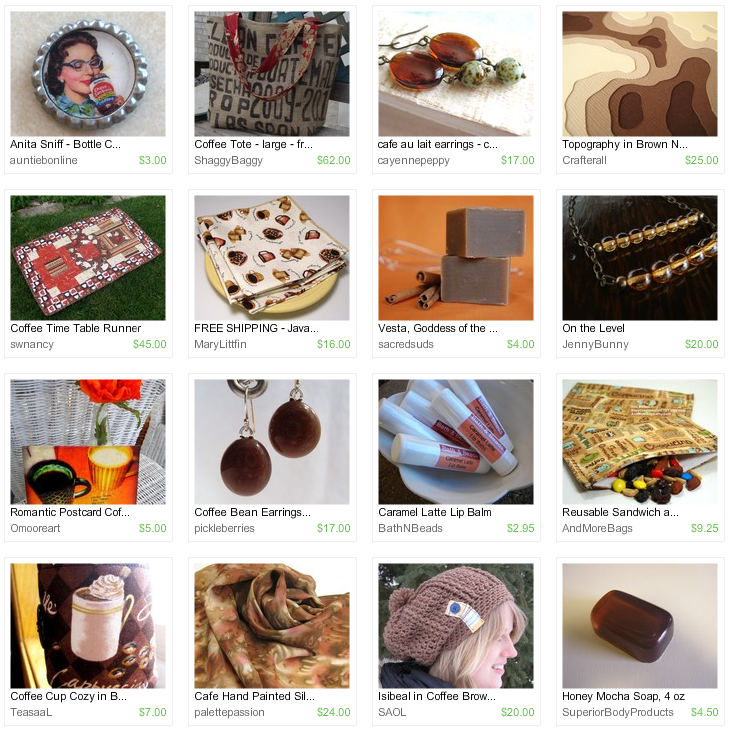 Visit Natalie's shop, pick your favorite item and leave a comment on this post about it. 7. Follow Natalie on Twitter. Comment back here with your Twitter link. Existing followers just leave your Twitter link here. Contest ends Saturday, September 4, at 12:00 noon Central. One winner will be chosen by Random.org. About two weeks after I opened my Etsy shop, I sold my first item: a small, folded page star book. I whooped when I saw the sale, hugged my daughters, did a little happy dance, and called my husband at work to tell him the news, and that we were definitely going out for dinner. Then, I went downstairs to my studio… and panicked. How was I going to ship this? What am I going to put it in? How many stamps will this require? Do I add a note? What do I say? What if the packaging rips and the book gets damaged or lost? What if mailing this will cost more than I charged for shipping? What if it will cost more than the book itself? What have I gotten myself into?! Thankfully, I am a major pack rat and a packaging freak, so I had plenty of materials on hand to get the job done and the book safely en route to its lucky recipient. Nearly three years later, I’m still adjusting my packaging supplies and techniques. Here’s some of what I’ve learned in that time. 1. Your packaging should ensure that your item arrives in the condition it was in when it left your hands. Just because a flat mailer is big enough to hold your work of art, doesn’t mean it will stay flat on its journey to the buyer. I’ve learned this the hard way and have had to remake and resend pieces to folks who were kind enough to give me frank feedback about the condition of the work I sent. 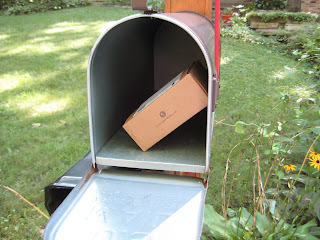 Too often, despite my overt “Please do not bend” stamps all over the package, the mail carriers seem to delight in cramming these mailers into mailboxes half their size, or the crumpled corners look like they’ve been dropped from a 20-story building. Solution: corrugated cardboard boxes. They’re heavier which means that I have to charge a bit more for shipping, but they come with peace of mind that it will take some serious and demented determination to ruin these bad boys. 2. Do whatever you can to keep the weight low. Make your shipping costs reasonable for both your buyer and your budget. I admit to being turned off by high shipping costs, but I also expect it when I’m ordering something that I assume will take a little extra care in packaging for safe travel. That said, there are quite a few lightweight options for packaging. Shredded newspaper, bubble wrap, bio-peanuts, and even those plastic air pillows from orders you receive are all great sources of low-weight filler. As a buyer, I get disappointed when I receive a package that is either needlessly heavy or for which the postage is significantly less than what I paid in shipping costs. Keep that in mind as you pack your orders. Invest in a decent scale. Buy one that will measure more than your heaviest item and show you pounds and ounces. Being able to weigh my own packages and print mailing labels from home has been an incredible time saver for me. 3. Recycling and being “Green” is great, but keep it professional. When I first started out, I packaged my bulkier items in old cereal and cracker boxes. 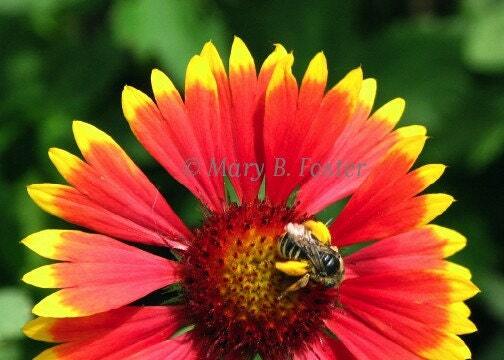 They were study, small and readily available. Since I didn’t want my buyers to think they had mistakenly purchased a random box of corn flakes, I split the seam on the boxes and turned them inside out so the kraft or blank white side was on the outside. A little tissue paper on the inside, and it was quite nice. As my sales have picked up, my branding has taken off, and my items are now in sets of more predictable sizes, I made the switch to buying my boxes online. I do still appreciate any sensible gesture toward eco-friendly packaging, as long as the two previous tips I’ve mentioned are met first. 4. Include “something” extra. Even if it’s just your business card, or just a note on a simple note card, a little “Thank you” or recognition of the sale helps confirm your professionalism. I have made nearly 100 purchases on Etsy, and the shops I return to are the ones who throw in something extra or take the time to handwrite a “thank you.” I love the soap and candle samples I get from bath and body folks, the postcard art from paper and print artists, the polishing cloths from jewelers, and the coupons from all the rest. If I get a box with only the item I ordered, it’s immediately a more forgettable purchase. Make your package memorable. But don’t break the bank. Try to include something that connects with your work: a small print of your art, a little doodle in the margin of the invoice, a sliver of a really nice smelling soap, a post-it note thank you on a stack of a few business cards, a few random stickers with your logo, etc. 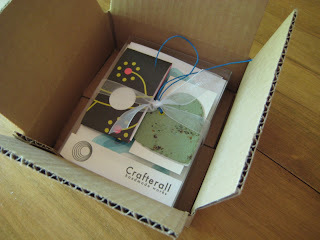 Every order I ship is packaged with a tag from Green Post (http://greenpost.etsy.com). Kendra at Green Post recycles my paper scraps into plantable seed tags in a variety of shapes and colors. It’s paper, it’s earth-friendly, and it’s a partnership I’m always proud to tout. 5. Finally, keep the outside of the package as clean and easy to read as possible. The more legible your mailing label is, the faster it will get to its destination. I didn’t know this at first and would add all sorts of flourishes to the address of the recipient. Not only was this time consuming, but it slowed down the progress of the package as it had to be hand read rather than scanned through the machine. 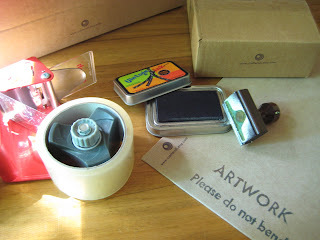 Now, I print my mailing labels directly from PayPal, and add a neat little stamp on the package with my shop logo and url. It’s professional and it gets the job done well. Unless you’ve worked in the picking and packaging department of a huge warehouse, all this packing and shipping is a bit awkward for a while. I’ve heard that some folks will send an item to themselves or to a trusted friend to see how the packaging holds up. Weather, international travel, customs, and fragility are also important factors to keep in mind, and there are oodles of resources online to help you figure these out. Do your best to get on the good side of your local post office employees. They usually know their stuff inside and out and can help you make decisions on packaging and shipping options. If you take no other suggestion from here, please learn to be flexible and proactive about your shipping. Learn from errors, pay attention to any packaging-related feedback you get, and experiment with materials and sources until you find something that works. Be proud of the package into which you place your work and mark with your name. I invite your packaging and shipping tips! Please share any lessons you’ve learned and any creative solutions you’ve come to as a result. I’d also be happy to hear what some of you include as your “thank you” gift or note. Thanks for reading! One of the many great things about a Minnesota summer is all the fun community events, festivals and celebrations. Sometimes the best events aren’t well publicized and you often stumble upon them while going about your normal activities. I stumbled upon one of those types of events recently in the SE Minnesota community of Lanesboro. 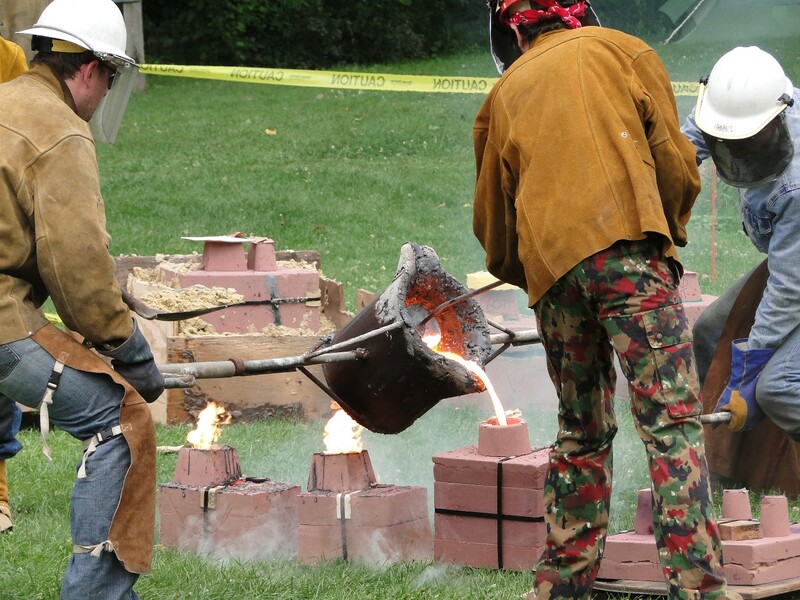 The Lanesboro Arts Center presented an Iron Pour with local artist Karl Unnasch (brother of HandmadeMN member Stena of Crazy Busy). I had the opportunity to watch the actual Iron Pour portion of the event. Earlier in the week, molds were made by those interested in leaving the event with their very own piece of iron art. 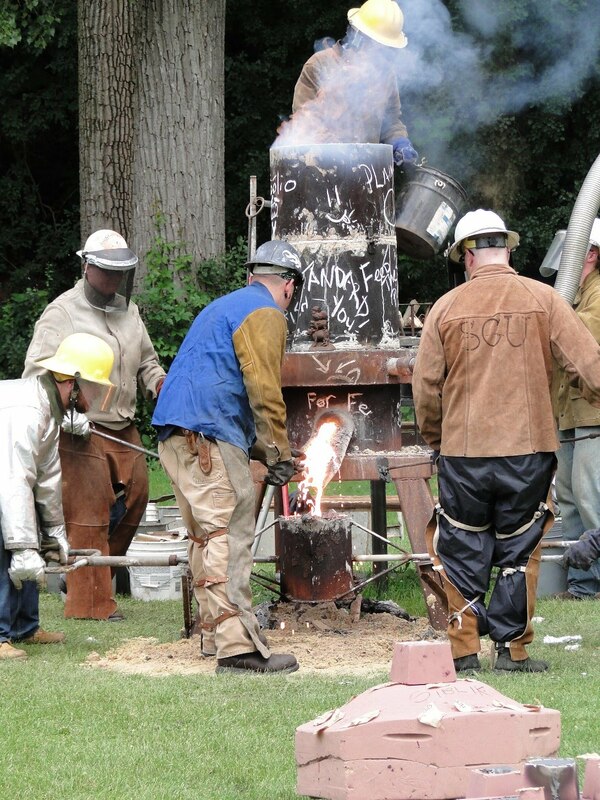 For a $25 fee, tools, materials and guidance were provided to anyone interested in making a molded piece of iron. 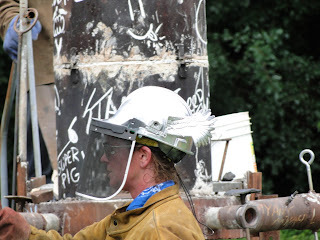 At the Iron Pour, the molds that had been created earlier in the week were lined up in Sylvan Park waiting to be filled with molten iron. Karl and the group of folks who work with him, set up a large furnace to melt scrap iron to fill the many molds that had been created. The molten iron is then poured into a bucket like container with large handles on each side for two people to carry and pour the iron into the molds. 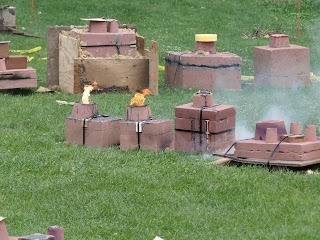 Those carrying the molten iron need to work quickly and carefully to pour the iron in each mold and then move to the next. While they are doing that, another batch of iron begins to be melted in the furnace. Once the iron in the molds is cooled, a completed piece of poured iron art is removed. As you can imagine, this is a really hot, dangerous process so they wear lots of personal protective gear to help prevent injury. Each artist gets a little creative with their gear as well. I liked the wings on this hat. In all, more than a tone of scrap iron was melted during this event. 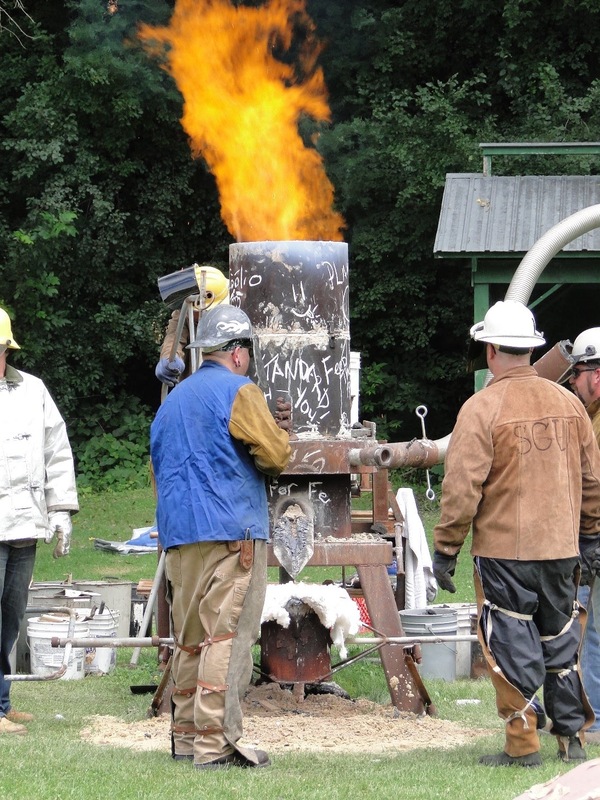 If you think this looks interesting, maybe you’d like to attend one of the other upcoming events in Lanesboro. Here is a link to the Lanesboro Arts Center web site where you can find more information about events they offer. 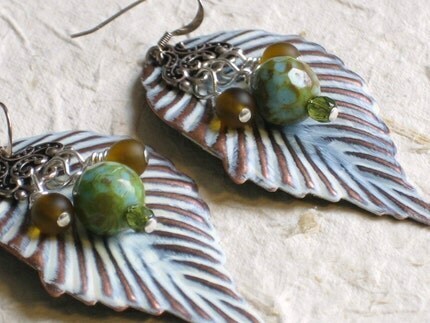 This week Lauren of Infaredstudio is giving away these lovely earrings. You can add a little asian inspiration to your wardrone with these smoke colored modern bamboo earrings. 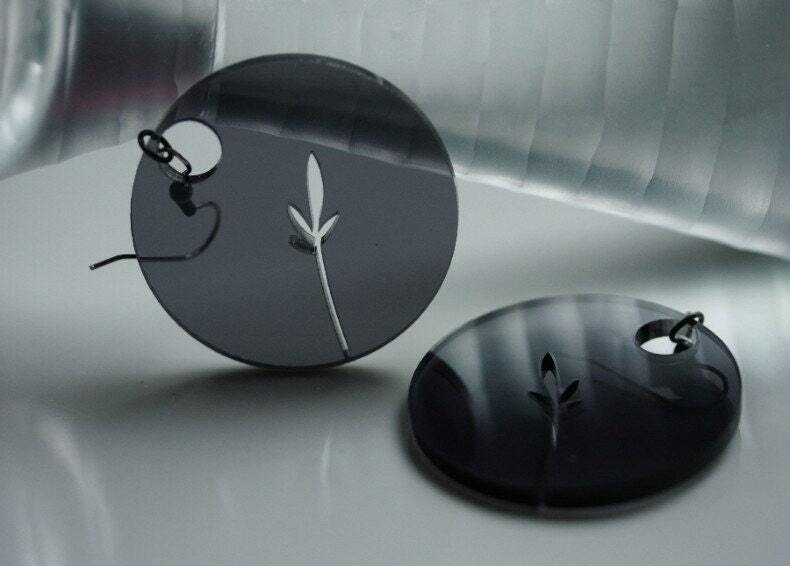 These simple and clean earrings are black acrylic on base metal posts and are 1.65 inchines in diameter. They come gift wrapped in a shiny black box. 7. Become a Facebook Fan of Infaredstudio. Comment back here with your Facebook name. Existing fans just leave your Facebook name here. Contest ends Saturday, August 28, at 12:00 noon Central. One winner will be chosen by Random.org. Did you know that August is Water Quality Month? Neither did I until I started rummaging through the internet for a topic for this blog post! Water is essential to our health! We need water to do dishes, for the laundry, and for general cleaning. Our pets, gardens, and lawns all need water. We wash our cars with water and those of us who do windows need water too! A trip to the lake - whether it be for fishing, swimming, or boating - all revolves around water. And who doesn't appreciate the serenity of a sunrise or sunset over a body of water? Given that this is another hot, muggy Minnesota August day, I am really appreciating these Icy Water Earrings by cayennepeppy. And take a look at this - Lake Reflections by PenguinPalace - I am always amazed at what we find on our lakes right here in Minneapolis! 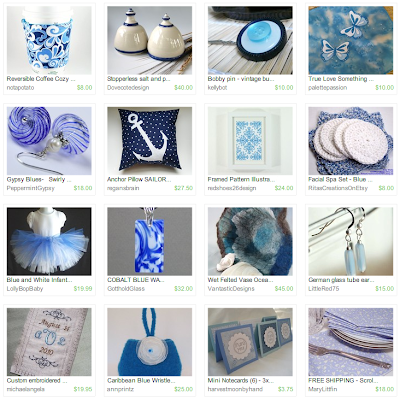 And here is one of those sailboats by oodlesofcolor that you see on in the photo above! And who doesn't enjoy a nice cup of tea (which requires us to boil water) on the deck with friends and family? We certainly know that Kav122 does! Not up for tea? Then how about getting out the pitcher, some lemons, some sugar, and some water and make lemonade with GrandmasCraftGarden! So, when you use water during August, appreciate it a bit more! Remember all of the things that you use water for on a day-to-day basis. Remember that it is essential to our health! And remember that it brings us a lot of enjoyment day in and day out in many, many ways! Happy Water Quality Month! 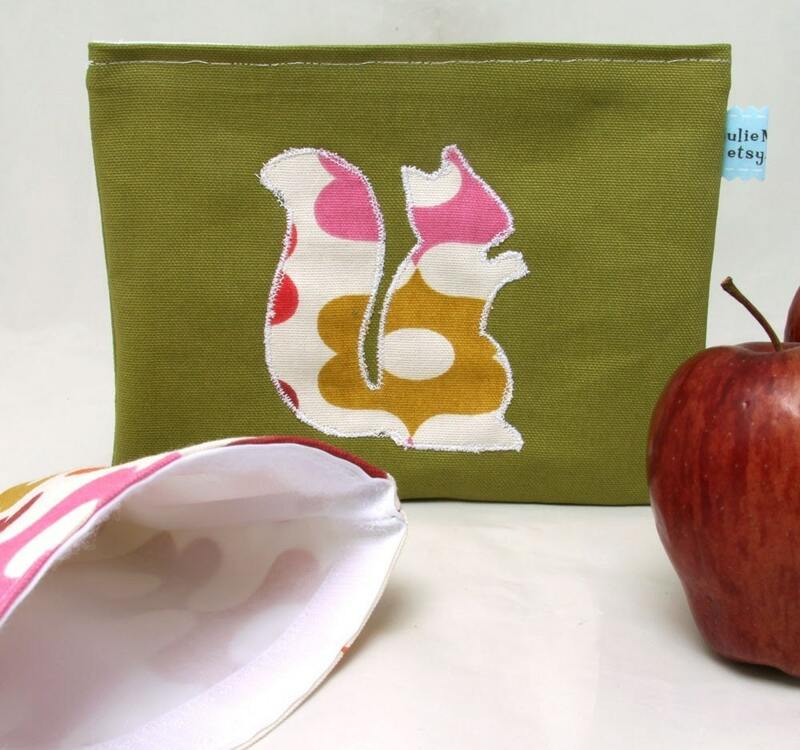 Today we bring you these awesome Reusable Snack and Sandwich Bags from Julie Meyer! Break away from the throw-away plastic bags with these stylish reusable bags. Patchwork pieced from heavy weight decorator weight cotton canvas and an inner lining of 100% food-safe, water-resistant nylon. Each bag is stitched with no exposed seams and closes with a velcro strip along the entire length of the opening to keep your food fresh. Visit Julie's shop, pick your favorite item and leave a comment on this post about it. Contest ends Saturday, August 21, at 12:00 noon Central. One winner will be chosen by Random.org. What is a pot melt, you ask? A melt is when fusible glass is layered into a pot or onto a wire mesh, then fired at a very high temperature so that the glass melts. 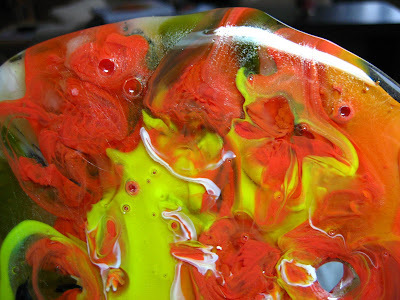 The melting glass drips down onto a flat, prepared surface, creating interesting color combos as it fuses back together. 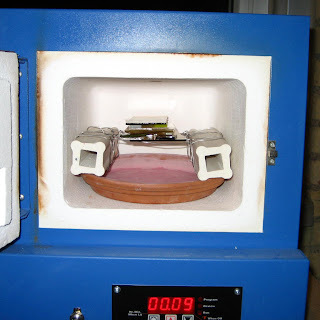 The firing temperature for pot melts is much higher than for simply fusing glass. 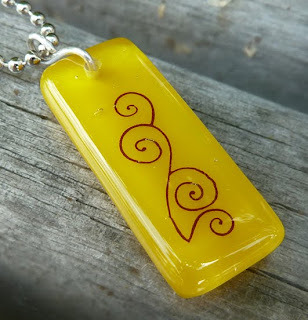 When firing fused glass pendants or other items, you want the kiln to get just hot enough to slightly melt the glass, so that it fuses together but doesn't completely melt. These items are typically fused at about 1460 degrees. In a pot melt, you need to raise the temperature to about 1700 degrees, which will completely melt the glass so that it flows. I tried this for the very first time recently, and wanted to share my process and the results with you. First, I applied kiln wash to the inside of a 6 inch terra cotta pot saucer, so the melted glass wouldn't stick to it. I also put a large piece of clear glass on the bottom of the saucer; I had read somewhere that this helps keep the kiln wash from peeling off and embedding in the glass. 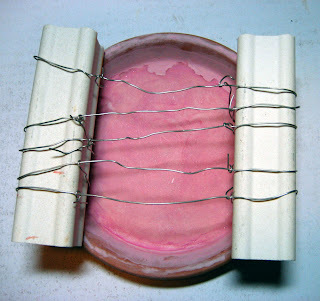 Next, I strung wire between two 6 inch kiln posts and laid that on top of the terra cotta saucer. 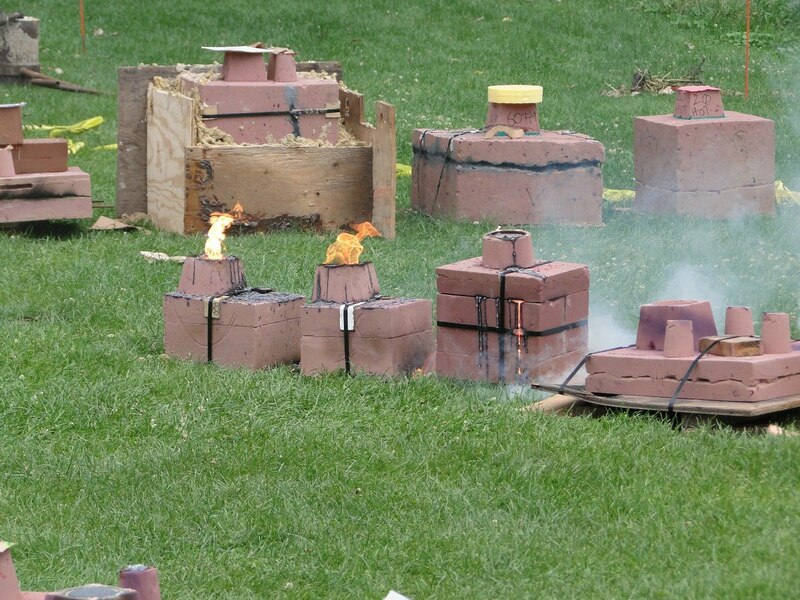 If you are trying this at home, make sure you use specially made wire that is safe at high temps. I got mine at a local glass company where I get my fusible glass. 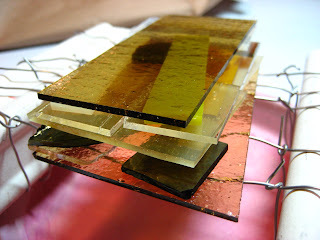 Then I layered pieces of fusible glass on the wire. 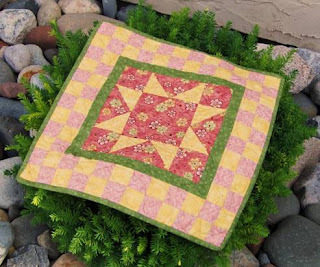 A key here is not to use too many dark colors; they tend to overwhelm the finished piece and leave it muddy. Also use very little black for the same reason. 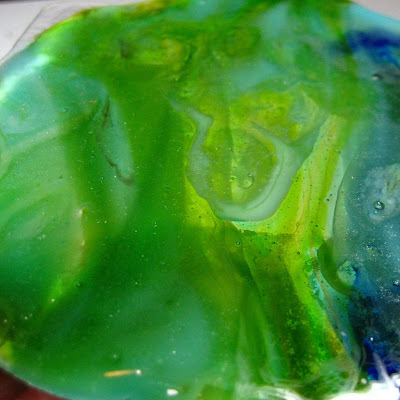 I used a mixture of opaque and transparent glass. 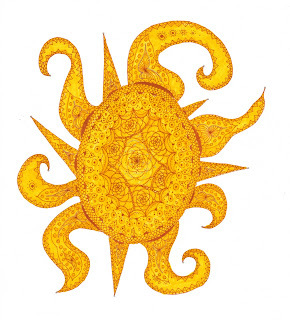 This month's challenge theme was "Sunny". Check out the great entries below, then scroll all the way to the bottom to vote for your favorite! The winner will receive an advertising spot on our blog. Voting ends at midnight on August 15. 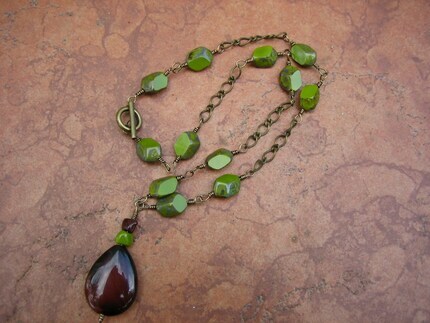 This week Lily of LilYkaT Studio is giving away this elegant necklace. This lovely handmade Y-style necklace is made with semiprecious stones including moukaite ovals, ocean jasper beads, freshwater pearls, and glass seed beads. The 19 inch necklace also features a fun, silver-plated star & moon clasp. Open to Residents of the US, Canada, and Australia. 7. 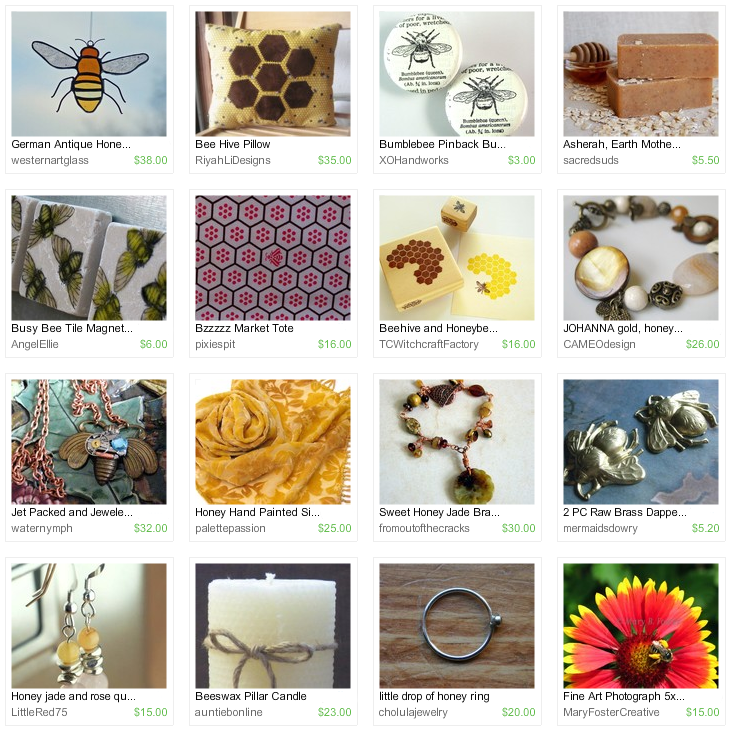 Become a Facebook Fan of LilYkaT Studio. Comment back here with your Facebook name. Existing fans just leave your Facebook name here. 8. 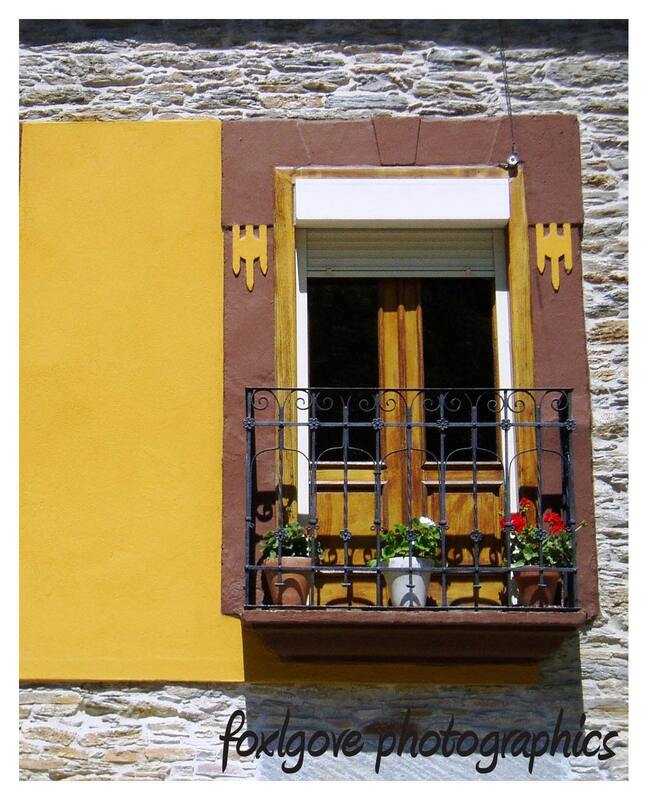 Follow LilYkaT Stufio's blog. Leave a comment here letting us know you are a follower. If you are already a follower, leave a comment anyway, as each comment is an entry. Contest ends Saturday, August 14, at 12:00 noon Central. One winner will be chosen by Random.org.